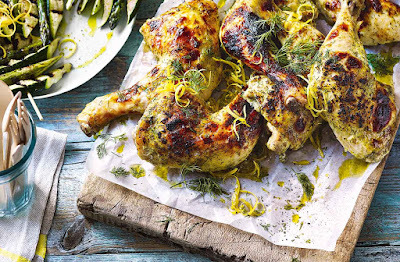 An easy chicken recipe is a must-have for a summer barbecue, and these tender, herby buttermilk legs definitely fit the bill. They're quick and easy to make – start in the oven and finish on the barbecue or griddle for the ultimate smoky flavour. Preheat the oven to gas 5, 190°C, fan 170°C. Put the buttermilk, half the lemon zest, the lemon juice, oil, dill and garlic in a large bowl and add the chicken legs. Mix to coat, then cover and chill for 30 mins. Heat the barbecue, if using. Remove the chicken legs from the marinade, shaking off the excess. Transfer to an ovenproof dish and bake for 20-25 mins until cooked through. Remove the chicken from the dish and cook for 3-5 mins on the barbecue or in a hot griddle pan over a high heat until the skin is lightly charred. Season and serve garnished with a few extra fronds of dill and the remaining lemon zest.